Holy, holy, what: is our vision of God as strange as it should be? In the year that King Uzziah died, I saw the Lord sitting on a throne, high and lofty; and the hem of his robe filled the temple. Seraphs were in attendance above him; each had six wings: with two they covered their faces, and with two they covered their feet, and with two they flew. And one called to another and said: “Holy, holy, holy is the Lord of hosts; the whole earth is full of his glory.” The pivots on the thresholds shook at the voices of those who called, and the house filled with smoke. My sermon from Trinity Sunday (May 27, 2018) on Isaiah 6:1-8. Listen to the recording at the bottom of the page or read my manuscript below. I bet if I handed out a piece of paper and some crayons to everyone, each one of us could dream up some far out visions of what heaven might look like. Several of us would color pictures full of blue skies with white fluffy clouds floating by. Others might include some pearly gates, roads covered in gold, and angels flying everywhere. More might decide that heaven needs people. So we’d include pictures of loved ones, making sure each person looked their best. We might want to include images from nature, like mountain ranges with amazing vistas and tropical paradises with white sandy beaches. Each one of our pictures would be different but I’m pretty sure all of them, whether we can draw or not, would be something beautiful. Heaven, I think, should be beautiful. It should be almost indescribable. Because when we imagine being with God, basking in God’s perpetual light, there’s no one word in the English language that can fully describe what we’d actually see. Heaven is more than just a place that looks good. It’s a reality that gives us a sense of wholeness, comfort, and peace. Heaven should feel like we’re finally home because heaven is beauty, peace, hope, and love made real. Heaven, in other words, should be gorgeous. But what if it isn’t? What if heaven is very strange? What if heaven isn’t only blue skies and white fluffy clouds but is more like the image described in our first reading from Isaiah today? Isaiah, in this passage, is experiencing a vision. He meets God in the place where God promise to be, and all Isaiah can initially see is the very bottom of God’s robe. God, it seems, is sitting on an elevated throne, high in the sky. And hanging down, filling the entire space, is God’s massive robe. Now, imagine, if you can, the hem – the very bottom of a robe – filling up the this entire church. But don’t stop there. Also imagine that this robe engulfs the parking lot outside, the housing subdivisions all around us, and it covers the reservoir and even fills up the sky. This is the massive, gigantic, and overwhelming reality that Isaiah has to grapple with. Yet this vision of heaven, of the Temple, of hanging out in the place God promises to be, doesn’t end with only this overpowering picture of God. The vision continues with these strange flying creatures called seraphim who are like flying serpents filling the sky. These creatures who are tending to God each have six wings. Two cover their eyes, shielding themselves from looking directly at God’s face. They use two more wings to cover themselves, keeping everything discreet. The other set of wings are the ones they actually use to fly. And as they fly, these strange creatures begin uttering a phrase we are familiar with: holy, holy, holy. 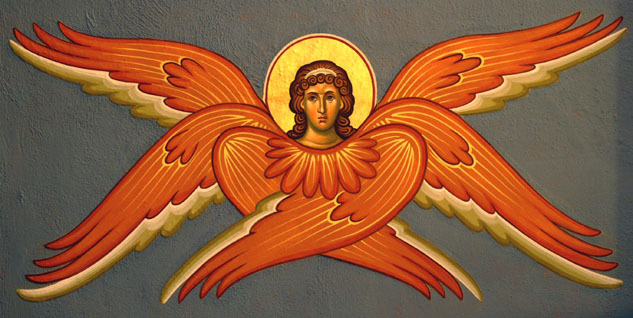 Yet the seraphim are probably not singing these words in a beautiful and melodic way. No, these “holies” are harsh, loud, and downright terrifying. They shake the very walls of this version of heaven and fill the place full of dense smoke. This vision is downright terrifying. And it’s one where every one of our senses is overpowered and where all our expectations about God’s house is undone. The beauty of heaven as we imagine it to be runs head first into the reality of who God is. And it’s at that moment when Isaiah does the only thing he can do: he admits exactly who he is. And then a seraph comes down, with a piece of red hot coal, to cleanse his words by burning his lips. I don’t know about you but this vision of God’s holy house doesn’t really match up with my own understanding of what being with God is like. But – maybe it should. Because our image of who God is influences what we expect God to be. And if our image of God, of this Father and Son and Holy Spirit; if this image is soft, and beautiful, and very peaceful – then we might not be seeing how incredible God actually is. God should do more than inspire our sense of peace. God should inspire our wonder. God should do more than meet our expectations. God, instead, should make our mouths hang open in awe. And once we finally get it, once we finally realize how indescribable and unimaginable God actually is – it’s then when we realize a fundamental truth about who we are. God is strange and terrifying and loving and peaceful all at the same time. Which means there really is a God and we’re not it. We are not the center of the universe. We are not the ones in control. We are just us: human beings that are imperfect, small, and sometimes broken. The God who we worship and celebrate and who connects with us each and every day is a God that is so vast, so massive, so indescribable that even the prophet Isaiah only got a hint of just how incredible our God actually is. Now, our vision of heaven, of what it’s like to hang out with God, should, I think, include blue skies, angelic beings, and every beautiful thing we can imagine. Because this is the image of God’s kingdom that we see expressed in the garden of Eden. This is the image of God’s realm that Jesus’ ministry pointed to and what he worked to bring about. The golden roads, beautiful scenery, and a heavenly city full of people is the vision of what forever looks like in the book of Revelation. Our relationship with God is an honest-to-goodness treasure and our faith is a beautiful jewel that will hold us forever. But this God who is our treasure is also a God full of strangeness and awe. And that’s a good thing. Because it takes a strange kind of God to do that very strange kind of thing and decide to become like Isaiah, small and human and cowering in God’s throne room. It is the God who is beyond measure who chooses to become just like us. Because the only thing that can match God’s indescribable reality is God’s indescribable love. We are not the center of the universe but God has decided that you are the center of God’s. And so God doesn’t wait for us to be ready for heaven before God shows up. Instead, Jesus comes down and through his life and cross, we see what God’s kingdom of hope, love, and mercy looks like. And then, through our baptism, through our faith, and through the simple act of being fed at the Lord’s table, we discover just how central all people are to God. The heaven we imagine will never be as strange as we need it to be. Because it’s only a strange kind of God who would decide that each of us, as we are, are necessary for the new reality that God is bringing about.